A reader contacted TechCrunch on Thursday with a copy of an email sent by the company. It doesn’t say much — such as when the breach happened, or if a hacker is to blame or if it was a data exposure that the company could’ve prevented. 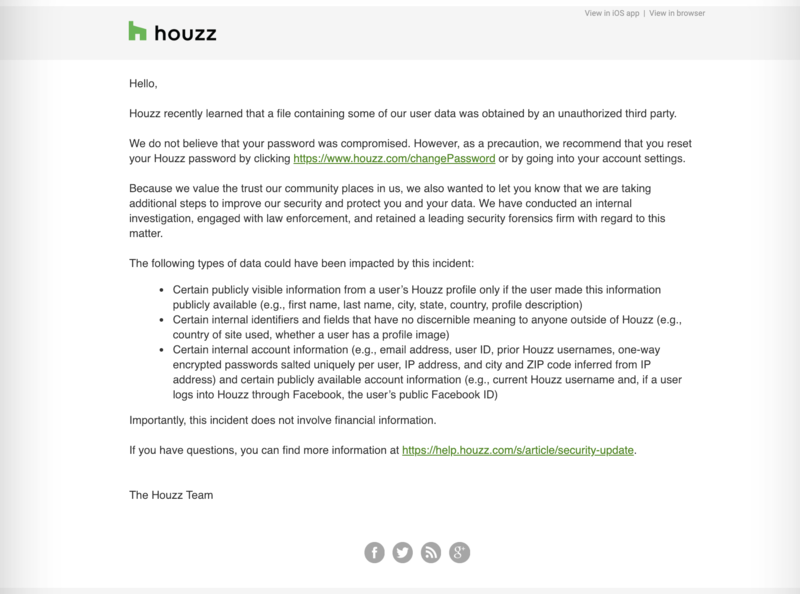 Houzz said some publicly visible information from a user’s Houzz profile could be affected, such as name, city, state, country and profile description, along with internal identifiers and fields “that have no discernible meaning to anyone outside of Houzz,” such as the region and location of the user and if they have a profile image, for example, the company said. The company last year was among many mocked for sending out emails to users alerting them of mandatory changes to their privacy policies ahead of the 2018-introduced EU General Data Protection Regulation (GDPR) law, saying it “value[s]” its customers privacy. “Their opening lines offer a glimpse of the way legal policy and user experience are colliding under the new regulations,” said Fast Company.